Yupcharge is the most experienced manufacturer of charging solutions for hospitals, clinicals and medical services. 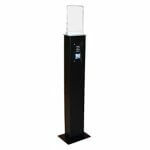 It provides robust, economical and cost-effective charging stations to maximize visitor satisfaction and minimize disruption to medical staff. 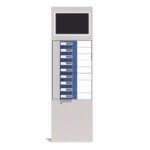 Incorporate our fast and safe charging stations into your hospital equipment to offer a service to your patients and visitors, providing them with a more pleasant and comfortable stay. It is an opportunity for the sector to incorporate the “Hospitality” as part of the Customer Experience. We give your center a more technological and up-to-date image (2.0). Offer an optimal service to your clients and internal staff. Make it easy for your patients to be connected to their family and friends. Make your patients’ waiting hours and stay more enjoyable. Intuitive charging devices, easy for the user. Generate a positive image in the mind of the visitor. Useful and practical for the internal staff of the center and autonomy for the user. 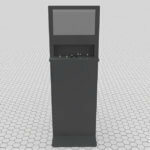 Charging stations with rugged, safe and attractive design. Compatible with 100% of smartphones in the market. Fixed or portable charging solutions.Charging plates with integrated fast charging technology. Exclusive AcT technology (agile charging technology) protects your mobile’s battery. Installation system “Plug & Play” (connected and ready), and easy maintenance. Ideal advertising support for establishments and brands. They can include some functions such as Wi-Fi, IoT or Big Data. Exclusive Strong-Kevlar fast charge cables that transmit maximum energy. Any user who goes to a specialist doctor or visits a relative or close relative who is hospitalized often goes to a hospital without knowing how long he or she could stay inside. Nowadays it is more and more common for people to carry an external battery with which they can charge any mobile device, be it our mobile, tablet or laptop. But these batteries or power banks also run out. Today, we can’t live without our mobile phones and we carry them with us every day at all hours. But, what happens when our battery runs out and we don’t have a nearby charger to recharge our mobile in the hospital? In order not to panic, Yupcharge offers our charging solutions for the use of third parties, so that customers can use for free and charge their devices thanks to our charging stations for hospitals and medical services, mobile chargers for dental clinics, mobile chargers for medical centers, and mobile chargers for health centers. This investment on the part of the health sector is aimed at offering a better experience to hospital users, who need to spend many hours inside this type of facilities. But the health sector has different types of health institutions that vary according to the type of service and specialty they offer. What type of mobile charger is best suited to each health institution? Charging stations with their own autonomy: Tango, Tango DS which includes a 7″ digital display, Tango Lite or Blue XL, which has 10 autonomous batteries with wireless Qi charging and 3 connectors. All of them can be customized with brand communication. Funk desktop charging station. 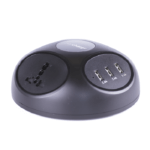 It is a charging base that requires to be connected to the electrical network. It can be customized with the brand. Small locker-type charging station such as Soul, with 3 lockers that include charging cables strong-kevlar 3n1 charging exclusive, and door lock with traditional key. It can be hung on the wall or shelf. 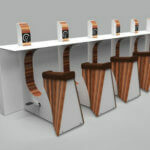 Groove is a public charger of minimalist design that adapts very well to large common areas (see Clinic). If we want to provide a security service and offer a service to charge mobile batteries not only to visitors but also parallel to the staff, we can choose the Twist DS charging box, with electronic Keypad closure in each box, and 22″ and 50″ digital screen to broadcast advertising or corporate content of the brand in an easy and simple way. Do you want to offer the safest and most innovative charging service to your patients? Contact us now and don’t hesitate to consult us about any technical aspect you need to know.